This past season we made it to the semi-finals of the playoffs. We played great defense at times, but we also played bad defense at times. Overall, we played playoff caliber defense, but our goal is to play championship caliber defense. We did some great things, but there are 3 things we need to do better on defense this upcoming season. Last season we worked a ton on pursuing to the ball carrier and instilling the mentality that when we play defense all our defenders must be able to get to the football. We gotten a lot better at our pursuit, but it’s an area we still need to get better at if we want to play championship defense this season. As coaches, we have to do a better job of making sure the kids understand the importance of maintaining pursuit lanes and gang tackling the ball carrier. If we are able to get numbers to the ball carrier we will deter big plays, demoralize offense, and naturally generate turnovers. The fact of the matter is that if a player doesn’t have the ability and/or desire to get to the football then they will not be playing defense for us. Pursuit angles are important, but the kids have to want to run to the ball carrier, a lot of it has to do with effort. This season we will be holding the kids accountable for their effort. Championship defenses do an excellent job of forcing turnovers. If we can generate 3 or more turnovers in a game we will have a great chance of winning that game. Creating turnovers is something that needs to be practiced. The art of creating turnovers is a combination of effort, technique, and mindset. First off, the kids need to understand the importance of turnovers. 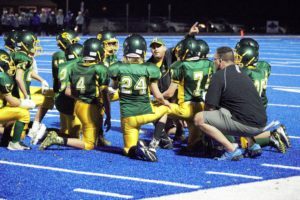 You have to make sure that the kids understand the importance of turnovers and put forth the EFFORT required to generate those turnovers (like getting to the ball carrier!). Secondly, there are several different techniques that can be used to force a fumble, techniques like the punch and club/rip. These are techniques that will be practiced daily. Lastly, the kids have to have the mindset that they will force a turnover this drive. They have to come into every game thinking that they will generate at least 3-4 turnovers. Every game that we generated 3 or more turnovers are games that we won. Our goal is to generate 3 or more every single game. 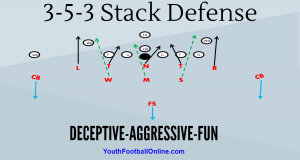 Block destruction is just as important as tackling. If you can’t beat blocks, you won’t be able to get to the ball carrier and make a tackle. As a team, we need to do a better job of beating blocks. We need to do a better job of maintaining leverage as we physically beat the block. We have to teach our defenders that they have to be violent with their hands. They just can’t try to go around the blocks, they must destruct them. We want our defensive linemen to dip and rip and we want our linebackers to shock and shed, while pursuing inside-out. Our linebackers understood how to shed the block, but we didn’t do a good enough job SHOCKING and then shedding the block.